David A. Castro is a prophet of God. He has seen Jesus, angels, and future events, mostly via supernatural dreams and trances. As the Psalmist David of old, he can truly say of the Lord, “Thou hast visited me in the night,” (Psalms 17:3). Born and raised in New York City, Brother David has a compassionate spirit, emerging from the rough and tumble Williamsburg neighborhood of Brooklyn. He was a little boy when he first heard the audible voice of Jesus. He has received a variety of supernatural dreams and visions, and has the ability to understand and articulate their dynamic functions. David has been educated in the school of the Holy Spirit, has a divine prophetic calling upon his life, a great devotion to God, and a naturally curious mind. He gives himself to private biblical research and prayer at the feet of Jesus. David is an avid entertainment and education media enthusiast. He holds Master of Arts degrees in Liberal Studies (Brooklyn College, New York, 2007) and in Media Studies and Film (The New School University, New York, 2008). More recently, he has created and published his first movie, a full-feature sci-fi comedy. As David’s mom, I would like to share with the world a little bit about him. Although he became a Christian at the age of 22, he never really caught the spirit of the world when he was “in the world.” He was always very studious and inquisitive, and liked staying home and going through books even when he was not enrolled in any college. It was not a dramatic or surprising development that he became the Christian and the servant of God that he is; and once saved, I’ve never seen him lacking the spiritual fervour evident in Christians who are the most on fire for the Lord. I’ve never seen him spiritually cold, but always preaching, teaching, prophesying, or sharing dreams and visions with me and everyone who comes to our home. David has lived with me all his life, including throughout all his ministry years and back to college years, so I know his lifestyle well. Since his conversion, David, whom we also call Tony, would often come out of his room testifying that he’d just had an awesome supernatural experience: a trance, a divine sight, an audible voice, or an astounding dream from the Lord. Often such revelations would reveal insights about our family members, neighbours, or friends, and would prove to be of God. He has often seen visions disclosing who his true friends are, and who are not. It’s not always fun or a party living with a prophet of God. It often seemed that David would be living a parable, and I would be affected by the overflow of the lessons of the Lord, occasionally unpleasant ones. But now God is doing a new thing in the earth and in my son’s life and ministry, and the season of jubilee is now at hand, (Psalms 126:6). The winter is now past and spring is in the air. This is the refreshing, and as I am seeing David drink of the New Wine of the Holy Spirit and get drunk with Him, I am being affected by the overflow of that. Hallelujah! Many friends who come over or call, are also touched by the Lord through what God is doing in our home. Laughing, shouting, sharing the Word of God, and loving Jesus, is the earmark of our home. I was raised in the Pentecostal church. My father, the great Rev. Frank Vazquez, was a pioneering pastor and evangelist; he got saved when the Lord instantly and miraculously healed me of an incurable disease in a revival service in Brooklyn, New York, when I was only three months of age. My father-in-law, Rev. Roque Castro, was also a pioneering Pentecostal pastor and evangelist for many years; and both my mother and mother-in-law were intercessory prayer warriors, always laying anointed hands on us and the kids and praying for us at every visit. In our services, God confirmed His Word with signs and wonders; healing, prophesying, holy laughter, jumping and screaming in the spirit, groanings in prayer, and sharing dreams and visions, was a frequent occurrence. We were not unfamiliar with the manifestations of the Holy Ghost. What David experiences and shares with me is right in line with the same Spirit I have come to know from my childhood. His writings also attest to the same as they explain the things of the Spirit and encourage believers to enter Him. His books, however, go deeper than what we knew back then. Not very much profound spiritual writing was available to us decades ago. But this generation has within its reach a whole new set of writings by authors who are experiencing the fresh anointing of the Holy Spirit and the fresh manna of revelation knowledge. Now even the hidden mysteries from of old are becoming clearer by the Spirit of revelation. God is teaching us how to operate in spiritual things so that we can better cooperate with Him. I believe that what God has invested in my son, the author of this book, over many years of divine visitations in our home, will show up in the reading of it. God is not playing games. If He is going to take someone like David and sovereignly ordain for him to not only experience His visitations, but then have him teach those things in this book—and have him pay an awesome price in the process—it’s got to be because He’s going to do something by it. I ask, then, that each reader sincerely and earnestly apprehend every word that is contained in this volume. It is anointed by God. May your pure hearts each receive impartation of the Holy Spirit and enable you to experience, and understand, supernatural dreams, according to the Bible. In the wonderful Name of Jesus. Amen. As David’s older brother, it gives me great pleasure to comment on him, his walk with the Lord, his publishing journey, and on this project. In our home, he was always reading, writing, and drawing; we all saw him as a scholar in the making. As we grew up, together with our two older sisters, somehow books and study always attracted him more than the diversions of the entertainment culture of the time, such as the disco scene of the 1970’s. It seemed something else was calling him. That he suddenly decided to go to Honolulu in 1978 and returned a year later as a born-again Christian, having seen the Light of God’s salvation that is in Christ, was not surprising. His consequent anointing from the Lord in dreams, visions, and revelations, also revealed a divine calling upon his life. Our family saw David’s preparation in the study of the Word of God and prayer, and the many rigorous attempts at publishing the books he has written. His experiences have resulted in a more mature and contrite servant of God, and enabled a gracious disposition and a piercing explanation of supernatural dynamics according to the Bible. We applaud David’s accomplishments in his decade-long formal education, too. We are all so proud of him and can’t wait to see what God will do next. My own journey has been dramatically impacted and influenced by this book. In the reading, I found insight that spoke to various valley experiences and dark places, from which God’s angels delivered me, as David teaches. The spiritual dimension is real, and the light showing from my brother’s contribution, including his visions about my life, undeniably changed me. May the Lord bless each reader of this book; it is written with both a grand experiential base, and a clear articulation of the same. It will change the reader. If one will read only one text on the subject, this is the one to read. It will describe and clarify supernatural revelations, anoint in this regard, and draw one closer to the Lord. My uncle Tony, David, is one of the most amazing and prophetically-gifted individuals I know. My first preacher, and the instrument God used for bringing me to the knowledge of the Lord, he has been ardent and vocal about his relationship with the Lord since his conversion in Hawaii in 1979. Via supernatural revelations, he has helped my spiritual life immensely, and offered insight to numerous of my life’s events. Our family has benefitted from his ministry many times, as the Lord would use him to communicate His leadings and blessings to our lives through dreams and visions. David, whom I have known since 1984, has ministered prophetically to me and my family on many occasions. He has stayed in our home and we have stayed over in his many times and he always shares what God has revealed to him in dreams and visions. Extraordinary confirmations have been given not only concerning our lives, but also about other individuals and signs of the times. In 1988, I was privileged to be the first person to read the first draft of this Dreams book, and I instantly declared it is a comprehensive, foundational work: previous works point to it and henceforward any serious work on the topic will need to refer to it as an authority. Twenty years later, after some additions and polishing, I again have to establish it as an authoritative contribution to the topic. David’s friendship has been a great blessing all these years. Through a friend, I came across a booklet entitled Supernatural Dreams and Trances (Chapter 8 in its entirety of Understanding Supernatural Dreams According to the Bible, A Living Classic, by David A. Castro). That was in 1987. At that time, I was leading an intercessory prayer group and teaching the Bible among Charismatic Catholic women, in the basement of our church. Most of the women there were elderly Christian believers but with little or no understanding of the supernatural, even of valid supernatural manifestations of the Holy Spirit, yet we had begun to experience some spectacular manifestations in our midst. It became a common occurrence to us—whether together at church or alone at home—to hear the voice of an angel or of Jesus, to see an amazing vision, or to feel the tangible anointing of the Lord’s presence. We would all share our experiences with each other when we got together but we really couldn’t understand what was being revealed to us, why they were being revealed, and whether or not these things were of God. Since I was the one to come across the booklet, I got to read it first. It was a real blessing. I had not seen this kind of writing in Christian bookstores. Having gone through it and being edified as I was, I passed it around to all the intercessors in our group. They were all very blessed by it also. They practically wore it out passing it around. The women were all excited as they talked about the points David made, and there was a stir among us as we became more enthusiastic about supernatural experiences. The book answered a lot of our questions about the supernatural and laid our fears to rest. It gave us peace to know that the manifestations of the Lord in our midst were indeed of Him, and gave us faith to go on to even higher ground—we began having even more visions and revelations of the Lord, and more understanding of them. The booklet, we all found, was very informative and eye-opening. That it is now only one Chapter of a much larger work, can only mean that God is indeed moving by His Spirit in the area of the supernatural and that He wants us to be knowledgeable about it. For that one Chapter which we read to be the blessing that it was, I know that this greater work which is presented to the reader now, will bring great blessing to whomsoever will take up the invitation and enter into the fuller realm of the Spirit of God. My family and I have known Brother David Anthony for over twenty-nine years. We attended the same church for a while and occasionally ministered together. He also worked with my husband, Wallace, and our sons, in our flooring company on occasion. We have been blessed by his ministry many times as he has often received pertinent words from the Lord for us over the years. Sometimes they were quite extraordinary. He is one of our personal intercessors and one of our closest friends. David’s gift is not only in his ability to get a message from God but to explain it, too. He will not only prophesy from a vision, but then he teaches from it, shares principles, and personalizes them. This really matters because we don’t just want to have revelations from the Lord, we need to understand the meanings and the practical applications they have. Brother David’s book is timely for our generation. His accuracy in prophetic ministry and degree of experience with supernatural encounters from God does make him indeed qualified to teach about supernatural dreams, and his writing is indeed according to the Bible. I believe every reader will be blessed by it. To God be all the glory. Understanding Supernatural Dreams According to the Bible, A Living Classic, is one of the most phenomenal books I have ever read. It not only educates a person on the subject of dreams, but brings one into a new awareness of the Spirit of God. I have been in the church all my life and, having been raised in a Christian home, have enjoyed wonderful blessings of the Holy Spirit. Also, I have experienced manifestations of the Holy Spirit in the prophetic, including in spiritual dreams. But for many years, I have had dreams without having a clear understanding of them and often without satisfactorily interpreting them. This book has enlightened my scope on dreams, visions and trances. I have learned that dreams can be disclosed as a series of events and visions as still pictures showing what the Spirit is speaking to His prophets. After thoroughly reading this book, I am able to understand and interpret my dreams and visions more than ever before. I have also been able to help others understand theirs. My walk with God has increased, too, because I am able to adhere to His leadings, warnings and revelations by His Spirit guiding my life through dreams and visions. David A. Castro is a man of valor who hears the voice of God. He saw me in a dream and described me accurately before ever seeing me in person. He is being used as a catalyst by God for the New Millenium. Get ready. God is doing a new thing. As God is pouring out of His Spirit upon us, we shall see more visions and dream more dreams. Your sons and your daughters shall prophesy—prophesy through dreams and visions. How can you understand them? Through the unveiling of the Holy Ghost and the reading of this book. This book has become my second bible!!! I would like to recommend to every Christian who is a Prophetic Dreamer or who is seeking an understanding in dreams to read Understanding Supernatural Dreams According to the Bible. Truly this book gives insight, wisdom, and depth of knowledge and revelation like no other book about dreams that I have ever read, and I have read several while searching for a real understanding of my own dreams and interpretations of the same. Brother David’s book and his God-given knowledge of dream interpretation is practical and can be applied to real life situations. Such was the case when David helped me understand a dream that I had concerning my family and the house I grew up in as a child. As a result of my dream, and David’s interpretation and application, my sister, Paulette Hobgood-Alston, mentioned above, and I fasted, prayed, and anointed the entire house, where my family still lives, from top to bottom, according to Matthew 12:29 and 16:19. We also prayed for my young nephew, Jeffrey, who was autistic at the time. We claimed victory for his healing, and God moved powerfully. The night of our special prayer, I dreamed that Jeffrey was talking to me in a normal way. I would ask him questions and he would respond to every one of them and answer me back more intelligently than ever before. The next morning, Jeffrey’s mom, my sister Tanya, reported a remarkable change in him: she was excited about an improvement in his ability to communicate. Soon afterwards, she testified that his teacher wrote her a letter acknowledging a notable improvement in his performance at school. Even at home he has been speaking articulately, whereas before he would usually just point with his finger. Glory to God! Our family believes that the Lord has done a miracle for the boy. And it has drawn his mom, and all of us, closer to Him. 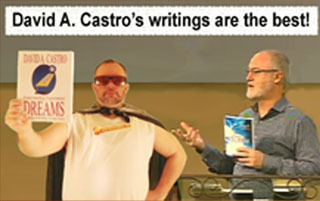 I praise the Lord Jesus Christ, and esteem Brother Castro for his divine connection to the supernatural and for his interpretation of dreams. Read this book and experience it for yourself. I had always known deep inside that we are created to experience the Lord in a supernatural way but never knew how to express that belief or much less understand it. However, because of God’s infinite mercy and grace, He broke through to me, in 1997, through a supernatural dream that wasn’t like anything I’d ever experienced before. (I learned later by reading David Castro’s book that Jesus had visited me in a night vision.) Around the same time, my wife, Raychelle, also started experiencing some supernatural dreams of her own. This new territory of God-given dreams caused us to seek for answers to know what we were experiencing. We also had a burning desire to know why God was blessing us in this new area of our spiritual walk with Him. We came across some books about supernatural dreams but found that they were not detailed enough to help us with our individual experiences, or to help with how these experiences should be comprehended in the spirit by the Word of God. Some of those books relied very heavily on psychology and man’s view of dreams instead of the pure view as revealed in the Word of God by the inspiration of the Holy Spirit. In my search for a helpful reference I stumbled across a book entitled Understanding Supernatural Dreams According to the Bible, A Living Classic, on the Internet and before even getting my own copy I just knew that God was going to use it to help me. My wife and I were not disappointed! Not only did this book answer a lot of questions that we had about how God uses dreams, it also opened us up to new things of the Holy Spirit that we had not even known were available to us as Christians. If you are hungry and thirsty for more of the Lord, then you know that a fluffy book full of man’s opinions on a certain subject is the last thing in the world that you have time for. This book has been an incredible blessing for me and my family. I had to order more books to give my friends because I honestly can’t be without my own copy. I praise God for the grace and mercy He has shown my family by bringing this book to our attention so that we could benefit from the teachings of David A. Castro. I’ve had the awesome opportunity of spending some personal time with Brother David—we laughed mightily every day while at the Toronto Blessing (Toronto Airport Christian Fellowship Church) for a week—and I can personally tell you that he is a specially anointed vessel of God. He has been chosen to not only experience the Lord Jesus Christ in phenomenal, supernatural ways, but also to be able to teach us these truths that only the Holy Spirit of God can reveal. Deep calls unto deep—read this book and you’ll go deep! Praise the Lord! I have known Brother David Tony Castro for thirty-two years now, as I was the first pastor with whom he was associated after his conversion, and he has lived right across the street from our church all this time, with his mother Alice. Over the years, I have seen David grow in the things of God and into a minister of the Gospel and author. His prophetic ministry has also been a blessing to us on several occasions. Just a few months before establishing our radio ministry in 1996, David shared a dream he had with me in which I was operating recording equipment, so that affirmed that endeavour for me and encouraged me in it. Earlier, in 1995, he shared a prophetic dream about me that showed that God was going to increase the authority and influence of my Ministry. Soon afterward, I got a call from a fellow Bishop informing me that the Lord had instructed him to ordain me as Bishop, and this occurred in August of that year. The prophetic word of the Lord in David’s dream became a reality. As I have examined Understanding Supernatural Dreams According to the Bible, I have found it well-balanced and edifying. It relies on the sound doctrines of the Christian faith, clarifies some of the profounder areas of Scripture, inspires the believer’s faith for those things which are above and, most importantly, it encourages us to seek the Lord Jesus Christ with all that is within us, and to live wholeheartedly for Him. I recommend this unique book as I believe it will prove a blessing to every reader. "Over the past few years, it has been a privilege to come to know Brother David A. Castro. He has become one of my 'friends in the prophetic.' As it is in any long distance friendship, you often do not see each other or talk together as much as you would like. But all I have to do is pick up David’s writings and I am instantly 'with him.' His books have become my friend! "First of all, I would like to say that, although David’s experience level in dreams, visions, and revelations, is expansive, he does not write only from an experiential frame of reference. He attempts to ground the believer firmly in the Word of God. Oh, how I appreciate this! And not only does he write from experience and Scripture coupled together, he writes from his heart. This is how impartation occurs. This is what happens when people absorb this book, Understanding Supernatural Dreams According to the Bible. "Now I don’t just read David’s books. I use them for instructing others. I have been an administrator and an instructor at various Christian Schools, and I have also pastored. Over the years, I have developed numerous sets of study notes and training materials on various topics. I am constantly on the lookout for quality materials on prophetic themes that communicate with integrity and balance both biblical accuracy and experiential understanding. They are not easy to find. But I have referred to, taught from, and had many of my students read Understanding Supernatural Dreams According to the Bible, and also David’s second book, Understanding Supernatural Visions According to the Bible, because I have found in them these qualities. "Wisdom comes over many years, as one cultivates a holy fear of the Lord. Wisdom is a brilliant Teacher, and a principal thing that we are exhorted to seek. Let’s seek the Holy Spirit’s ways of wisdom and add it to our knowledge and experience as well. The gifts of the Spirit can seem to appear overnight, but His wisdom only comes by spending time in God’s presence. "There is a vast need today, the need to find tutors of the Holy Spirit who can combine deep spiritual truths with experience, and who are also able to show the pitfalls to avoid. Again, I turn to David’s writings. He knows how to encourage you, the reader, to believe God for supernatural encounters and yet make sure that you are seeking the Giver and not the gift. "It is with great confidence and joy that I highly recommend my friend, this wonderful work, to you. I trust it will become a sort of 'paraclete,' one called alongside to help. May the Lord Jesus add much understanding to you as you read from the pages of this trusted friend. I have found it to be among the best I have ever read to help believers gain wisdom, insight and understanding on the often-neglected subjects of dreams, visions, and supernatural revelations. You’ll read it again and again and receive fresh understanding each time. David is a personal friend of mine, and he is a great friend of the glorious Lord Jesus Christ. Blessings to you." I highly recommend the teachings and writings of David A. Castro on dreams and visions. After reading his books and attending a series of his meetings in Connecticut, I can attest to the benefit of his comprehensive approach to teaching. In my over twenty years of ministry, I have rarely read a book like David’s which so effectively relates the specific area of supernatural dreams to critical keys of the kingdom: worship, intercession, spiritual warfare, faith, and most importantly, intimacy with God. I have known Brother David for over seventeen years and we have become good friends. We have had extraordinary times in the Holy Ghost together—we’ve been to the Toronto Blessing church together several times—and I attest to the accuracy of David’s prophetic ministry. I’ve seen him minister to many people and as he would share a vision or dream or prophetic word it would prove to be a blessing. His words from the Lord for me, too, have confirmed God’s leadings in my life and edified me. Hanging out a lot with David, I have personally heard him share many visions that God has given him, and teach about supernatural things in depth. Being a psychiatric practitioner, I can appreciate David’s input on psychological as well as spiritual dynamics. I am using some of David’s teachings to bring God’s realities into my life and the lives of those in my congregation. I have learned a lot from Brother David and I consider him a great friend. May the Lord bless every reader. Brother David has been our good friend for over seventeen years now. We’ve seen him move in the spirit with incredible accuracy. On his first visit with us in 1994, while riding a Greyhound bus on the way to our church, the Lord gave him a vision, which turned out to be a very pertinent and timely word for us, resulting in clear direction for the season. We often refer to David as the Sleeping Prophet because he hears from the Lord in his sleep as much or more than he does during his waking hours. Some of his experiences have been very astounding and his prophetic visions are usually clear and precise. His books are written from that depth of experience. We know that you, the reader, will find many things in his writings that will stir your spirit to a new and higher level in the things of God. As the author of this book, I would like to acknowledge posthumously a friend of mine who recently went on to be with the Lord, Debra Ruise, a precious Handmaiden of the Lord. Debra received the Holy Spirit when I prayed for her at her church while I was ministering there sometime in 1990. After the service, she bought two of my booklets, Supernatural Dreams and Trances, and, Sleep in Heavenly Peace, both of which are now Chapters of this present book. I ministered in her church again a few times and always found her to be the loudest praiser—she would shout to the Lord with total abandon. The Lord did bless Debra in a wonderful way as she got the Spirit of the message in my book. She got it! It was for those of like precious faith for whom I wrote this book. When I visited Debra’s home to collect a written testimony, and learned she had graduated to Heaven, her Mom, Missionary Lorine Cephus, gave me permission to publish it as I was able to remember it, and I have done just that. She also told me that her daughter began serving the Lord more faithfully since receiving the Holy Spirit, and that Debra’s youngest daughter, Faith, has become the church’s loudest praise-shouter. Praise the Lord! Now that’s impartation! It is in the spirit of Christian love that I acknowledge Sister Debra here and dedicate this testimony of hers to her three beautiful children, Andrea, Kevin, and Faith. A trance is an actual displacement of the mind wherein one may see into the spiritual (invisible) realm. The word “trance” comes from the Greek word ekstasis, which means “ecstasy, a being put out of place, distraction, trance, especially one resulting from great religious fervour; great joy, rapture, a feeling of delight that arrests the whole mind,” according to Webster’s Dictionary. W.E. Vine, a Bible expositor, defines a trance (supernatural ecstasy) as being “a condition in which ordinary consciousness and the perception of natural circumstances were withheld, and the soul was susceptible only to the vision imparted by God”; and, “ecstasy is a condition in which a person is so transported out of his natural state that he falls into a trance,” a supernatural state wherein he may see visions in the spirit. A trance is basically an ecstatic experience wherein one is more or less stupified, stunned. Herein he’s susceptible only to the visions God would impart. If a trance, which is also known as a deep sleep from the Lord, occurs while the person is already asleep, any of the visual or actual kinds of supernatural dreams may be experienced. One may see visions, hear words (earthly or heavenly ones), or he may even leave his body and travel in the spirit for a special reason. Of course, these things are not to be self-induced, but experienced only as the Lord wills them. Otherwise we’re out there without His protective armour. Acts 10:9-16 On the morrow, as they went on their journey, and drew nigh unto the city, Peter went up upon the housetop to pray about the sixth hour: And he became very hungry, and would have eaten: but while they made ready, he fell into a trance, And saw heaven opened, and a certain vessel descending unto him, as it had been a great sheet knit at the four corners, and let down to the earth: Wherein were all manner of fourfooted beasts of the earth, and wild beasts, and creeping things, and fowls of the air. And there came a voice to him, Rise, Peter: kill, and eat. But Peter said, Not so, Lord; for I have never eaten any thing that is common or unclean. And the voice spake unto him again the second time, What God hath cleansed, that call not thou common. This was done thrice: and the vessel was received up again into heaven. The voice speaking and the symbols used were familiar to Peter. But because the message jarred his tradition, God confirmed Himself again, and again, with the same vision. It was seen thrice, three times. God often confirms and reconfirms Himself when He speaks to us by supernatural means—especially when we’re not fluent in communications divine. His will is that we become “family” with heavenly things—our citizenship, our “conversation,” is up in that sphere, (Philippians 3:20). And if He wills, He can speak with us even as He spoke with His servants of old. Numbers 24:4 He hath said, which heard the words of God, which saw the vision of the Almighty, falling into a trance, but having his eyes open. Paul here conversed supernaturally with Jesus Christ while in a trance. They communicated in words speakable because Paul remained on earth during this experience. He wasn’t beholding marvels in the Third Heaven as he did on another occasion. While in his trance and seeing a vision from of the Lord, each of these men received an instructive revelation from the Lord which directly clarified his circumstance at that particular time, and pointed him to the will of God for that hour. Peter had been so busy preaching the Gospel and causing revival among the Jews that he neglected Christ’s commission to preach the Gospel in all the world, to every creature. God had to define to him the Great Commission in a new light, in a supernatural way. Balaam’s vision was directly related to Israel’s blessing and helped him to prophesy those blessings. It was God’s time for those blessings to be spoken on Israel’s behalf and Balaam had made himself available to speak God’s will, so God used him. In great danger during persecution, the Apostle Paul desperately needed to know God’s leading. In a trance while praying, he received the guidance and encouragement he needed. While in a trance, we may see and/or hear what is most prominent in our spirits and receive God’s wisdom for our immediate situation. While seeking the Lord in prayer some time ago, I’d been asking Him if I should preach less often on the buses and subways in New York City, where I live. At that time, I was persecuted and belittled for preaching in public. In prayer one night, the Lord took me in a trance. In its first stages, I saw myself in a vision preaching more fervently, for that had been on my heart for some days. Then the trance intensified, and the Lord blessed me in other ways, too. After a few minutes, they all quieted down and backed off, and allowed me to go on preaching to them. I continued unceasingly as though I hadn’t heard their complaints. Then I got off at my stop. There are greater and lesser degrees of ecstatic experiences. One may “soar higher” or “see clearer” than another in visions and revelations when stunned by the “electrical touch” of God’s Spirit. I use the term “electrical touch” because the anointing is often very similar to the current of electricity. But it’s not painful or tormenting. Rather, it is rapturous and delightful, as defined by Webster. On the greater scale, one may be en-tranced into a profound spiritual sight and be literally, physically paralyzed for awhile by the Spirit of God as He communicates to him. It is truly one of the most life-changing experiences a person could ever have. On the lower level, one may simply be “caught by surprise” and be in awe or wonder. Or he may be excited in the Holy Ghost, amazed at a miracle or vision, or just joyful in the Lord. Vine’s Expository Dictionary Of New Testament Words also defines a trance (ecstasy) as “any displacement, and hence, especially, with reference to the mind, of that alteration of the normal condition by which the person is thrown into a state of surprise or fear, or both.” The New Testament words “amazed,” “amazement,” and “astonishment,” have also been translated from ekstasis. This is what happened to the witnesses who saw Jesus raise the twelve-year-old damsel from the dead (Mark 5:42); to Mary Magdalene and others who were with her when an angel of God spoke to them of Jesus’ resurrection (Mark 16:8); to the people in the temple who saw a lame man healed and praising God (Acts 3:10); and to those who witnessed Jesus forgive and heal a man who had the sickness palsy, (Luke 5:26). Luke 5:24-26 But that ye may know that the Son of man hath power upon earth to forgive sins, (He said unto the sick of the palsy,) I say unto thee, Arise, and take up thy couch, and go into thine house. And immediately he rose up before them, and took up that whereon he lay, and departed to his own house, glorifying God. And they were all amazed, and they glorified God, and were filled with fear, saying, We have seen strange things today. Of the people present here, some were amazed, others glorified God, and the rest were filled with fear. Those amazed were en-tranced into the spiritual realm where they were yielded and inclined to visions of God (although He probably didn’t impart visions to all of them). Clearly, we’re to walk, even live, in the spirit, always acknowledging the Lord. And if the Spirit would bid us “Come up hither,” we should have an ear to hear and an eye to see the vision He would impart. We can enter the spiritual realm and see, hear, and converse supernaturally therein. If one allows fear to get ahold of him, God might back off and try another time, or another person. If he yields in faith with his mind and heart trusting in Jesus, there is no good thing which the Lord will withhold from him. It’s His good pleasure to show us the things from above and to communicate extranaturally with us therefrom. Daniel 10:7-9 And I Daniel alone saw the vision: for the men that were with me saw not the vision; but a great quaking fell upon them, so that they fled to hide themselves. Therefore I was left alone, and saw this great vision, and there remained no strength in me: for my comeliness was turned in me into corruption, and I retained no strength. Yet heard I the voice of His words: and when I heard the voice of His words, then was I in a deep sleep on my face, and my face toward the ground. Daniel 10:7-9 (niv) I, Daniel, was the only one who saw the vision; the men with me did not see it, but such terror overwhelmed them that they fled and hid themselves. So I was left alone, gazing at this great vision; I had no strength left, my face turned deathly pale and I was helpless. Then I heard Him speaking, and as I listened to Him, I fell into a deep sleep, my face to the ground. The Prophet Ezekiel said, “The hand of the Lord God fell there upon me,” (Ezekiel 8:1); again, “Suddenly the power of the Sovereign Lord came on me,” (Ezekiel 8:1 tev). Eliphaz said, “Fear came upon me, and trembling, which made all my bones to shake. Then a spirit passed before my face; the hair of my flesh stood up,” (Job 4:14-15). John said, “And when I saw Him (Jesus) I fell at His feet as dead,” (Revelation 1:17). As we saw with Abraham, with Jacob, and with Daniel, many of these experiences astonished and even troubled those who received them. The immediate effect that supernatural experiences can have upon us can be quite impactful and sobering. Trances are often the cause of the rethinking of matters and the reordering of many lives and ministries. Trances can also bless our souls, and our bodies as well, with a most wonderful anointing or presence from God. A cleansed, refreshed, and revived body and spirit, and an intense closeness to Jesus, are usual results of a trance. So we see that a much greater realm than the natural exists, and that a whole world of possible spiritual revelations and experiences from God is available. We may have a supernatural experience from the Lord, perhaps visit the Third Heaven and return, and be endued with power from on high! Many people who have had trances, gone to Heaven, or seen Jesus or an angel, testify that during their experience God anointed them with more gifts of the Spirit, more of the fruit of the Spirit (the character of Christ), more wisdom, or more of something else from God. At times, they didn’t even realize at first that they had been anointed in a special way. But after awhile they began to see new things, new gifts, or a greater anointing, operating in their lives and ministries. God may commission us anew in supernatural experiences, so it is likely He will also empower us anew to go forth. The trance comes in a matter of moments, usually, not in a fraction of a second, and not slowly and waveringly. It has also been known to come “suddenly.” It may begin with the same experience you’re already familiar with when enjoying the presence of the Lord (such as Holy Ghost “goose bumps,” fire, joy, etc. ), and then the Lord will take you further. You may be standing, sitting, prostrate, or on your back. Your eyes may be open, or closed. Your arms may be lifted, or relaxed at your sides. It may occur while you’re in church, at home in private prayer, or even while you’re sleeping—or for that matter, anywhere and anytime. God is God! But it will always bring a blessing, a confirmation, a direction, a refreshing, a healing, an exhortation, an instruction, an illumination, an enduement of power, or something else from God. He visits always with a purpose. And what He shows us in a trance may be visions of the highest, Paradisal Heaven, or of the lower, stellar heavens, or of the lowest, atmospheric sky. He may show us something about the past, the present, or the future; something about ourselves or someone else; something of universal significance, or personal. He may want us to see heavenly things, or earthly goings-on. But remember, unless He welcomes our input, it’s always up to Him. We should learn how to yield to the manifestations of the Spirit from one phase to the next. Often a great vision or supernatural experience begins with a lesser kind which we must permit if we are going to get to the greater. Too often we quit yielding too soon and limit God from going further. We grieve Him when we discern not the time of His visitation unto us. It happens in our church services, in our prayers, in our personal lives, and also in visions. As we saw in Chapter 7, the Patriarch Moses saw the great sight of the angel of the Lord as a flame of fire when he turned aside (yielded) to see it. When the Lord saw that he yielded to see, then God called unto him out of the midst of the bush, (Exodus 3:4). Moses had first said, “I will see now,” then he received a greater revelation of the Lord, communicated clearly with Him, received a new anointing, and was sent forth into fulltime ministry. The beginnings of a great move of God will usually be preceded by a gentle, subtle, indistinct moving of His Spirit. This may occur in the Church at large, or in our individual lives. A spiritual or pictorial vision, a still, small voice, an inner witness or impression, a glimpse or touch from an angel, or some other not-so-spectacular vision, often comes with a hint that more can possibly be seen. Even so, a spectacular disclosing may not result from a lesser kind. Either a manifestation of the Lord is a not-so-spectacular revelation, and nothing more. Or a spectacular disclosing occurs suddenly, without a hint of its coming. Even then, however, there may be a variety of experiences which the Lord would give us if we would embrace the first portion and just hold on for anything else He might send our way. On the Day of Pentecost, the 120 disciples in the Upper Room yielded fully to the supernatural visitation from on High. They yielded to the sudden sound from Heaven as of a rushing mighty wind. Then they received an apparition of the Holy Ghost as cloven tongues of Fire and allowed Him to rest on them. Then they were all filled with the Holy Ghost, and they began to speak with other tongues as He gave them utterance, (Acts 2:1-4). Those early Christians didn’t draw back from that supernatural experience because they had been seeking and preparing for just such a visitation, even though they didn’t know exactly how or when He would come. It’s the same way with us today. We seek God’s anointing with as much faith as is within us, but we don’t always know just how or when He will come. Yet we too, must yield by faith and concert with His doings—in simple, natural things, and in supernatural things. The Prophet Habakkuk stood upon his watch by faith. He set himself upon the tower and watched, to see what God would reveal unto him. He was determined to hear from God: “I will watch, to see...” Then the Lord answered him. We, too, can watch, to see what God would reveal. We too, can yield by faith and come to visions and revelations of the Lord. We too, can seek and find the Holy Spirit in a variety of manifestations, just as Jesus promised our Heavenly Father would give to them that ask Him, (Luke 11:9-13). In a vision of the night, Jesus was telling me about a young man that I would soon meet. The Lord told me he would need special attention and instructions from God’s servants because he is a sovereign vessel chosen of God for a special ministry in the last days. He also indicated that I would become one of his instructors. As He spoke this to me, I could see the back of this young man’s head as he was walking away from me, and it seemed this vision was about to end. Of my own volition, I decided to speak to the Lord and ask Him if I could see what the young man’s face looked like so that I would recognize him when he showed up in my life. I could trust that the Lord would let me know who he is at another time, in some other way, perhaps at the time I would meet him. But out of my present interest and desire to be ready for his appearing, I asked to see his face now. Still in this vision, I focused my eyes on the back of his head, while praying, “Please turn him around, Jesus, so I can see what he looks like. Please, Lord, turn him around.” After a moment or two, the young man turned around and started walking toward me, and I saw his face very clearly. Then I said, “Thank You, Jesus,” and then I woke up with full remembrance and understanding of the vision. This is a clear example of how God may welcome the cooperation of our faith and will in supernatural experiences. If we are willing to communicate with God in the realm of the spirit, ever careful to observe the borders which He would allow us, we may find the Lord hearing and answering our prayer, and communicating with us right there in that realm. The late William Branham was a twentieth century prophet who saw many astounding visions inspired of the Lord. He explained that many times it seemed as though his inward man would lift himself up and look over a wall to see what was on the other side with his spiritual eyes. In this way, he often saw into the realm of the spirit and received insights about people and situations which the Lord wanted him to respond to with the prayer of faith. This, too, is a clear example of how our own faith and will can cooperate with the Spirit of God in supernatural experiences. Noteworthy here is the fact that Brother Branham would pierce his eyes into the spiritual realm that way when God was indeed disclosing visions. He was anointed to see, but it was the anointing of the Holy Spirit that permitted him to see. The Prophet Habakkuk stood upon his watch, and set himself upon the tower because, being in the prophetic/revelatory ministry, he was anointed of God to watch and to see in the realm of the spirit, and he was appointed to a watchtower. When he watched to see by faith, the Lord was pleased to disclose some things unto him because of his pure motive—to pray, (Habakkuk 1:1-4). Now there will be times when the Holy Spirit impresses us not to “break through unto the Lord to gaze” (not to press our eyes in to see a vision at a certain time) lest He break forth upon us in some way. When the Israelites approached Mount Sinai at the time God was giving them the Ten Commandments, He clearly warned them “not to break through to come up unto the Lord,” otherwise many of them would perish, (Exodus 19:21). And when the Bethshemites looked into the Ark of the Lord (which was forbidden them to do), God’s anger was kindled and He destroyed over fifty thousand of His own people, (1Samuel 6:19). So He can be grieved in this area, even by His own people today. If we would approach Him one step at a time, we will be able to discern where to draw the line and not pierce our eyes further. We have got to know how to stay within the borders which the Lord would allow us. This is why it is so important to really know our Lord Jesus, His ways and His moods, and how to concert with them. The variety and levels of intensity of the manifest anointing is exhorbitant and cannot easily be categorized. A powerful manifestation of the Holy Spirit is not necessarily the Shekenah Glory, and neither is a great city-wide or nation-wide revival. Nevertheless, we can experience many glorious presences of God that stand out, that are distinctive. What is distinctive? I used to think a revival of the Holy Spirit, or an outpouring of the Spirit, or a supernatural manifestation, or a move of God, was necessarily noisy and dynamic, with visual evidences of God doing stuff. In Pentecostal tradition, this is what those have been. “Peace be unto you,” Jesus said, (John 20:19), while standing right there in the midst of the disciples. “Be still, and know that I am God” sings the psalmist, (Psalms 46:10). Stillness and peace, as a manifestation of a move of God in the midst, can be a collective experience, just as it often is an individual experience. A mind in turmoil—characterized by rampant thoughts, confusion, lunacy and panic—can experience perfect peace and normal thinking when Jesus says to it, “Peace, be still.” A whole church community, city, or nation, can also be brought to a state of peace, harmony, and normalcy, as God covers it with His presence. Rev. Kenneth E. Hagin said that during a totally still and silent church service (over sixty years ago), an unbeliever came in and sat. No one moved or said a word. After awhile, the individual felt the conviction to dedicate his life to the Lord; he stood up, made his way to the altar trembling, and got gloriously saved. He accepted Jesus as his Savior and spoke in tongues, without anyone’s assistance. Nowadays we are too quick to jump on people and school them through. But if we would take a chill pill and trust God, we might see more glorious things. God (His anointing, that is) is not all the time in the dynamic human effort, or in the voice of rejoicing and noise. On January 7, 2009, I dreamed of New York City about 10 or 20 years from now. The Lord’s presence was everywhere, the Glory of God had taken over the city and it was marvelous. But everything was normal. The city was intact—it had not been destroyed by water or fire or anything—and the normal business of everyday life continued as it is today. People were working, going to school, driving cars, and there were a number of new buildings, and the streets were very clean, calm and safe. In other city-wide revivals in history, there would be similar manifestations of peace, including significant decrease of crime, and many would be added to the Church daily, as many as the Lord would call. So, as much as some groups love the dynamic activity historically attributed to the Pentecostals, which is noise and movement, let us get ready to embrace the manifestation of the Holy Spirit that may be characterized by other activity, such as calmness, perfect peace, and normal thinking that facilitates the knowledge of the Lord. “For the earth shall be filled with the knowledge of the Glory of the Lord, as the waters cover the sea” (Habakkuk 2:14), and the sea can be active or calm. An officer in the Salvation Army once told me that in her services they often feel as ecstatic as the Pentecostals (who are known for running, jumping, and yelling), yet they remain still, enjoying the various touches of God privately. Many other churches, ministries, and individuals, also experience the ecstasies of God in a number of ways not characteristic of the more animated Pentecostals. I myself was becoming gloriously introduced to the ecstatic realm of visions and revelations even before becoming familiar with those churches and ministries that are lively like the Pentecostals. I became a Christian in 1979, in Honolulu, Hawaii, and returned to New York City in the same year, but it was in 1982 that I became a member of a Pentecostal church and started speaking with other tongues. For the first three years of my walking with the Lord, it was mostly just me and the Lord, and the move of His Spirit in my life produced not “Pentecostal manifestations” (except privately), but His move in my life at that time produced peace and repose. I do support and enjoy those manifestations. But we have got to become ecumenical and understand that many will not embrace that doctrine or religion style; yet we have got to embrace them. John 17:22-23 And the glory which Thou gavest me I have given them; that they may be one, even as We are one: I in them, and Thou in Me, that they may be made perfect in one; and that the world may know that Thou hast sent Me, and hast loved them, as thou hast loved me. In the move of God that we are in, which is going to become more extensive and world-encompassing, we will have to permit others’ theologies if we are going to please Jesus, because His wish is for unity—not doctrinal, but spiritual unity. We’ve got to not only put up with each other, but, believe that another’s journey and religious understanding and spiritual style is valid in the sight of God. They are the Lord’s. “Him that is weak in the faith receive ye, but not to doubtful disputations. For one believeth that he may eat all things: another, who is weak, eateth herbs. Let not him that eateth despise him that eateth not; and let not him which eateth not judge him that eateth: for God hath received him. Who art thou that judgest another man’s servant? To his master he standeth or falleth. Yea, he shall be holden up: for God is able to make him stand. One man esteemeth one day above another: another esteemeth every day alike. Let every man be fully persuaded in his own mind. He that regardeth the day, regardeth it unto the Lord; and he that regardeth not the day, to the Lord he doth not regard it. He that eateth, eateth to the Lord, for he giveth God thanks, and he that eateth not, to the Lord he eateth not, and giveth God thanks,” (verses 1-6). “But why dost thou judge thy brother? Or why dost thou set at nought thy brother? For we shall all stand before the judgment seat of Christ. For it is written, As I live, saith the Lord, every knee shall bow to me, and every tongue shall confess to God. So then every one of us shall give account of himself to God. Let us not therefore judge one another any more: but judge this rather, that no man put a stumblingblock or an occasion to fall in his brother’s way. I know, and am persuaded by the Lord Jesus, that there is nothing unclean of itself: but to him that esteemeth any thing to be unclean, to him it is unclean,” (verses 10-14).